Overtown is a nice historic area in Miami, but the crime rates there are higher than the Florida average, especially the violent crime rates. Moreover, drivers there are as reckless as in any other corner of Florida. You get the picture. People are suffering personal injuries in Overtown, and sometimes, these injuries are fatal. If a loved one of yours has died due to an Overtown accident, you as a survivor may have the right to claim damages for loss of financial support, loss of parental guidance, funeral costs, any occurred medical costs, pain and suffering, and other death-related losses. To be compensated, you'll have to prove that the accident happened due to someone else's wrongful act or negligence and that you had suffered damages. That's not easy to prove, so you'll likely need the best Miami wrongful death attorney you can call to help you. The Overtown wrongful death attorneys at the Wolfson Law Firm have served Overtown victims since 1963. We will answer all your questions when you call for free consultations on 305-285-1115. If you choose us to represent you, keep in mind that we don't ask for fees until we recover damages for you. Overtown is known as a historic neighborhood in Miami. 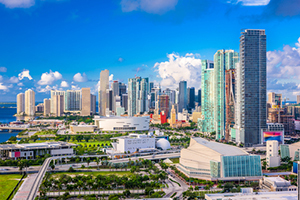 Overtown is just the second longest continuously inhabited area in Miami, after Coconut Grove. This part of the city has once been a cultural center and a night entertainment spot, before declining in the middle 20th century. The population has declined by 80%, from 50,000 to 10,000. Nowadays, despite the new developments, the population remains low at around only 6,000 people. Overtown is located between Allapattah and Downtown Miami. Its borders are from North 20th Street to the north to North Fifth Street to the South, and from West First Avenue and Florida East Coast Railway on the east to the Miami River and Dolphin Expressway. Many clients ask whether pursuing compensation after a wrongful death will help. Our answer is that it can to some degree. No amount of money can replace a family member lost in a wrongful death. Financial compensation will never eliminate the pain or complete sense of loss. But holding the responsible person or company responsible can help not only you but your family and, possibly, your community as well. It is entirely possible that your actions in holding someone responsible for their actions that led to the death of a loved one may prevent that person from harming or even killing someone else. That is an undeniable benefit to your community. The Overtown wrongful death lawyers at the Wolfson Law Firm can help you recover financially as you may deserve from the tragedy that has happened to you by losing someone close. Let’s start by free consultations on 305-285-1115 and take it from there. You’ll have all your questions answered and you will understand your legal options. We won’t ask for fees unless we recover damages for you.